BRU-GO'S Take-N-Bake pizza franchise business opportunity. 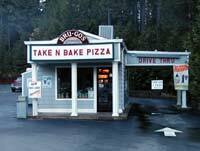 Free BRU-GO'S Take-N-Bake pizza franchise information. We're looking for entrepreneurs who want a great opportunity for success and profits with your own BRU-GO'S Take-N-Bake Pizza Co Co-Op Membership. Why BRU-GO'S? We simply know how to make a better pizza. From the freshest ingredients to our signature sauces and fresh crust, customers prefer the taste of our pizza. Your customers will return again and again once they experience a BRU-GO'S Take-N-Bake Pizza Co pizza. We have years of experience building and selling the finest Take-N-Bake pizzas to be found anywhere. We use this experience to help you establish your BRU-GO'S Take-N-Bake Pizza Co Co-Op and then keep it running profitably. In one of our corporate test kitchens we will fully train you in a hand on, fully operational facility so that your business will operate smoothly from the first customer's pizza. As your business grows, we will be there to offer further support and training for every aspect of your enterprise. And using our time tested recipes and pizza construction techniques; you'll be building the most satisfying Take-N-Bake pizza anywhere! To learn more about the BRU-GO'S Take-N-Bake Pizza franchise opportunity, simply complete the form below.